The U.S. national debt has surpassed the $16 trillion mark, with future unfunded obligations of over $120 trillion - and the government has no plan. Don't face the worsening financial crisis trapped, living paycheck to paycheck, with no way to protect your family's financial future! 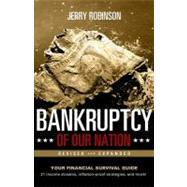 Featured on WorldNetDaily's popular website each week, Jerry Robinson is an economist, serial entrepreneur, international speaker, and radio host of Follow the Money Weekly, appearing on numerous TV and radio programs, including Fox News, and being quoted by USA Today and other news agencies on the topic of the economy, with columns appearing in publications such as Townhall and Financial Sense.